Why did I hate this wine? Melnik Castle, a thousand years of history, the largest vineyard in Bohemia, impressive barrel cellars that may once have been dungeons, and massive oak wine barrels built on site emblazoned with the family crest and other carvings. What’s not to love? 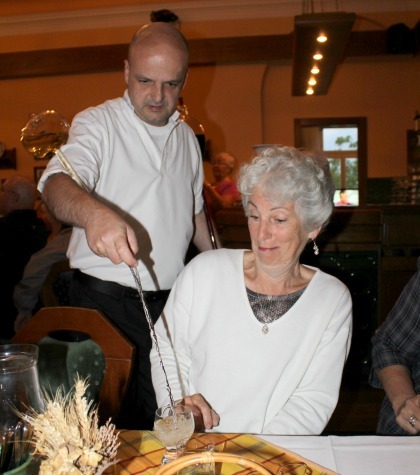 Part of the anticipation for my recent Avalon Waterways Cruise on the Danube was a half day trip to taste Bohemian wines at Castle Melnik in the Czech Republic. This was the traditional home of the Dowager Queens of Bohemia for 500 years and then was passed among noble families until it came to be owned by the Lobkowicz family in 1753. 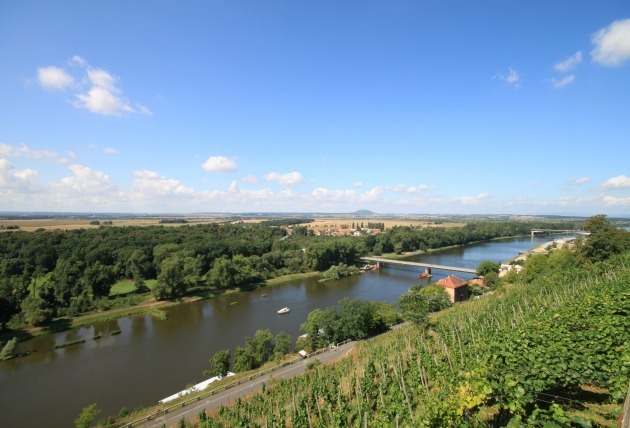 With 160 hectares of land it is the largest vineyard in Bohemia. It’s most popular wine was called Ludmilla, named after the grand mother of Good King Wenceslas. Historical trivia, Ludmilla was strangled with her veil at the instruction of her daughter-in-law Wenceslas’ mother who was jealous of her influence over her son. Ludmilla is now a patron saint of Bohemia and the Czech Republic as is her son Wenceslas who was murdered by his twin brother because he was too saintly. Ludmilla is somewhat of a play on the name of the grape varietal from which it is made – Muller-Thergau – developed in the late 1800s using cross breeding of Riesling and Madeleine Royale grapes. According to Wikipedia, although its popularity has decreased since the 1960s, it is the second most planted grape in Germany and is widely used in Austria, Italy, Hungary, Czech Republic, Slovakia, Slovenia, New Zealand and Japan. The wine is mild with low acidity, limply aromatic and is not considered to improve with age. Tasting notes are not my thing, the best I could describe would be drinking water from a not properly rinsed glass with residue of a mildly floral perfumed dish detergent. How could this be their biggest seller and yet I thought it insipid at best, sink swill at worst? It might have been power of suggestion. 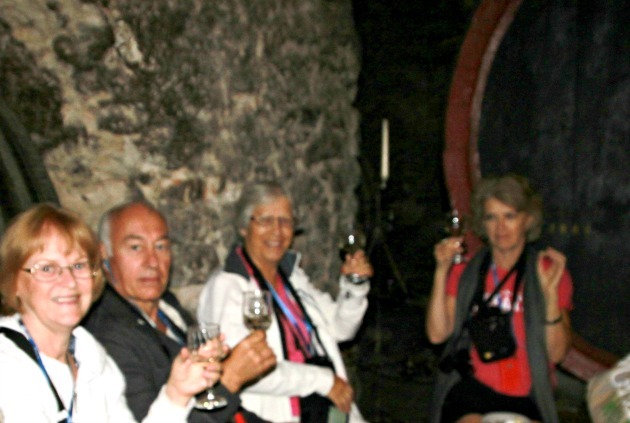 One of our tour guides didn’t care for Czech wines. She said that people had been known to say after seven or eight glasses, it was quite palatable especially with a chaser of Becherovka – a spicy bittersweet Czech liqueur that had strong flavours of cinnamon, cloves and nutmeg. We’d gone to a riotously funny folkloric dinner the night before where this same wine had flowed generously from flagons mounted on the shoulders of our waiters and connected to long pipettes which they kept stoppered with a finger when not refilling glasses. The wine did not improve after seven or eight top-ups but the Becherovka drunk to wash the taste out of my mouth certainly did. Three days after I got home, the word ‘elderflower’ came to mind. It’s very popular in Europe as a cordial or a lightly floral tea or flavoured water. A simple, hardly there, floral note, and it is turning up in bistro style restaurants in Canada as an expensive alternative to ice water. I think that was the flavour note in Ludmilla. If you are brought up with elderflower and loving the taste, you’ll like wine with these notes. As a Canadian, who responds to stronger fruitier or floral flavours, it totally missed the mark for the happy spot in my taste buds. sort of like like drinking chamomile or green tea wine. The Castle was lovely, the castle tour really interesting, as was the village of Melnik. the apple strudel at a local cafe was totally decadent. While I was not impressed with any of the Castle Melnik whites we tasted, they did have a very palatable Pinot Noir They also had other whites, like riesling and gewurztraminer which weren’t part of the tasting. Possibly they just offer their cheaper wines to tourists in bus tours. 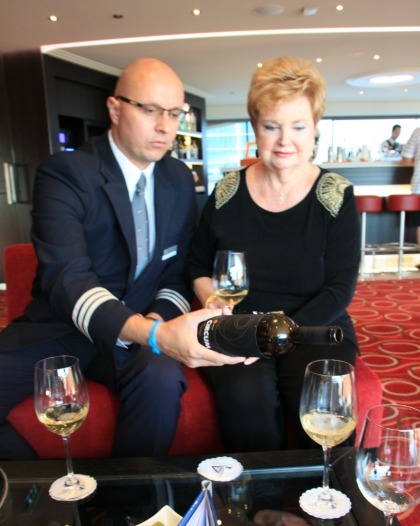 I did have a much better experience with wine tastings on board the Avalon Impression. The dinner wines for our voyage were a selection of German, Austrian and Slovakian wines which had a broad taste appeal to the North American palate. When the ship’s hotel manager and sommelier, Gabriel Antoni-Baca, learned how disappointed I’d been with my Czech wine tasting, he explained that some of Czechoslovakia’s best wine regions had ended up in Slovakia when the country split in two. He invited us to a private tasting of Nichta Wines from a fairly new family run Slovakian winery in Cajkov. I tried the Nichta Circum Devin, a late harvest white with a spicy aroma and delicate white fruit flavours reminiscent of a Muscat and Nichta Circum Blaufranksch a delicious spicy full bodied red with dark cherry notes. Well worth looking for this label.